A bronze plaque, dedicated to those who served under Galwayman and 1916 Proclamation signatory Éamonn Ceannt, in Dublin during the Easter Rising, was recently unveiled at the Galway City Museum. The plaque is dedicated to the members of the 4th Battalion, Dublin Brigade, of the Irish Volunteers, including the women of Cumann na mBan, who fought under Ceannt's command. 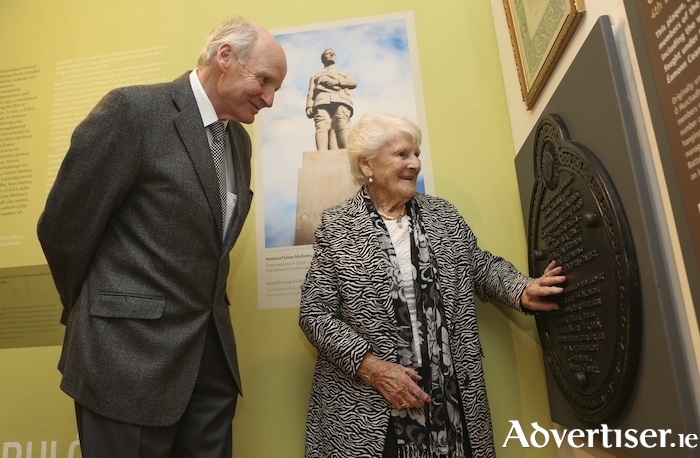 It was unveiled by Gráinne O’Neill, assisted by David Ceannt, grandnephew of Éamonn Ceannt. Another nephew of Ceannt, John Sheehy, was also in attendance. Mrs O’Neill is aged 96 years and resides with her son Ruairí, in Connemara. Her father, Captain Séamus Ó Murchadha, had originally unveiled the plaque in Dublin in 1949, in the presence of WT Cosgrave, the first leader of the Irish Free State. Both Ó Murchadha and Cosgrave were members of the 4th Battalion. However the plaque went missing for a number of years, but was rediscovered in 2016, hanging on a wall at City West Hotel, Dublin, whose management, represented at the Galway unveiling by John O’Farrell, transferred ownership to the 4th Battalion, Dublin Brigade, Relatives Group. Also in attendance were the Mayor of Galway, Labour city councillor Niall McNelis; Piaras and Fergus Brugha Bruton, grandsons of Cathal Brugha (vice-commandant, 4th Battalion ); Con Colbert, nephew of executed Captain Con Colbert, 4th Battalion; the Donelan family, representing Volunteer Brendan Donelan from Loughrea, who was killed in action while serving with the 4th Battalion at the South Dublin Union on Easter Monday 1916; Máire Flaherty (née McNamara ), daughter of Josephine McNamara (née O’Keefe ) who served with Cumann na mBan and the 4th Battalion at Marrowbone Lane; along with other family members. Galway City Museum has expressed its thanks to the 4th Battalion, Dublin Brigade, Relatives Group convenor, Pádraigín Ní Sheachnasaigh-Clancy, and secretary, Clare Eager, for lending the plaque to the museum. It can now be seen in the Revolution in Galway, 1913-1923 exhibition.